ABOVE: The Barrage de la Grande Dixence is the world's highest concrete dam, standing 285 meters (935 feet) high with a thickness of 200 meters or 656 feet at the base. The walkway at the top of the dam is 2,365 meters or 7,759 feet above sea level. 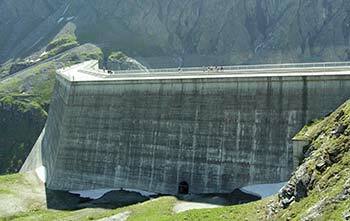 The Barrage de la Grande Dixence is the world's highest concrete gravity dam, standing 285 meters (935 feet) high with a thickness of 200 meters or 656 feet at the base. The public walkway at the top of the dam is 2,365 meters or 7,759 feet above sea level. What's more, you needn't be an alpinist to get there--you can simply drive, hike, or mountain-bike up to the dam's base and ride a télépherique, or aerial cablecar, to the top of the 15,000,000-ton concrete wall. Once you're at the top, you'll enjoy fine views of the Val d'Hérens and the Lac des Dix, which extends 4 km or 2.5 miles into the Dix Valley behind the dam. You can also take a four-hour nature hike along the Ibex Trail, where you'll enjoy views of alpine flora and fauna, mountains, and glaciers. Less strenuous tourist activities include son et lumière (sound and light) tours inside the dam and a pavillon d'exposition with exhibits and a 30-minute audivideo show. A hotel, restaurant, and souvenir shop are next to the pavillion and the base of the dam. The power company's official Web site has English-language text about the dam, guided tours, and activities. If you'd like to spend a night at Grande Dixence, visit the French-language Hotel du Barrage Web site. Finally, see the next page for a series of captioned photos of (and from) the Grande Dixence Dam.